VISION – To design some tools that help me to achieve my aims of losing weight, improving my fitness levels, improving my food choices and providing me with some time to devote to myself. During the design process, these aims were refined and finally set as follows. So did I manage to fulfil my aims and visions? What designs did I create? Did I use them and were they successful? A weekly food planner. I tried various methods of food planning and this is the one I finally settled on that is working for me now. The heading of soup, rice, pasta etc remain the same every week and I fill in the details of what I’d like to cook in each category. This method of working from pattern to detail has really helped me not to feel overwhelmed at the task of deciding what to cook. I often choose one cookery book each week and add a number of new recipes from it to my weekly planner. This keeps me learning new recipes and keeps our food interesting and varied. This works really well, but only if I find the time to update it on a sunday evening. I probably use this planner about half of the time but I do hope to build up to using it more often as it really helps with shopping, food planning and simplifying my decision-making in the evenings. A weekly activity/food/exercise planner. This is drawn up on a huge blackboard I have painted onto my kitchen wall. 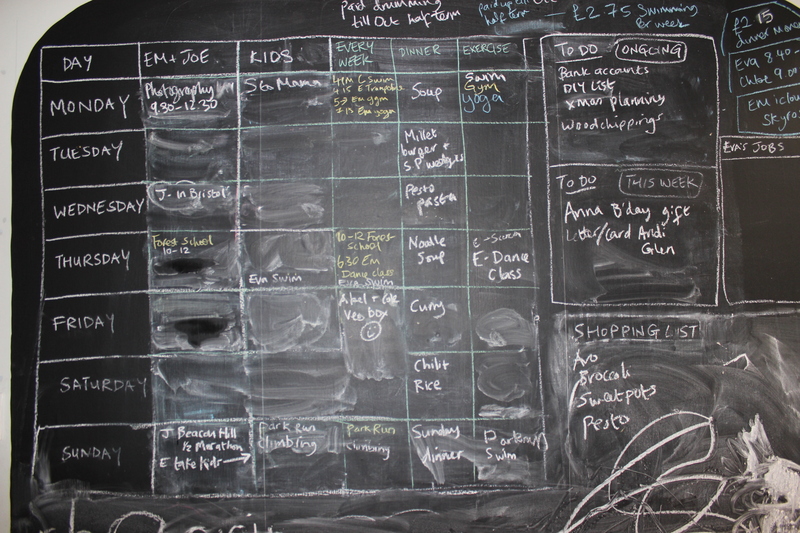 I update it every sunday evening to plan the week ahead. 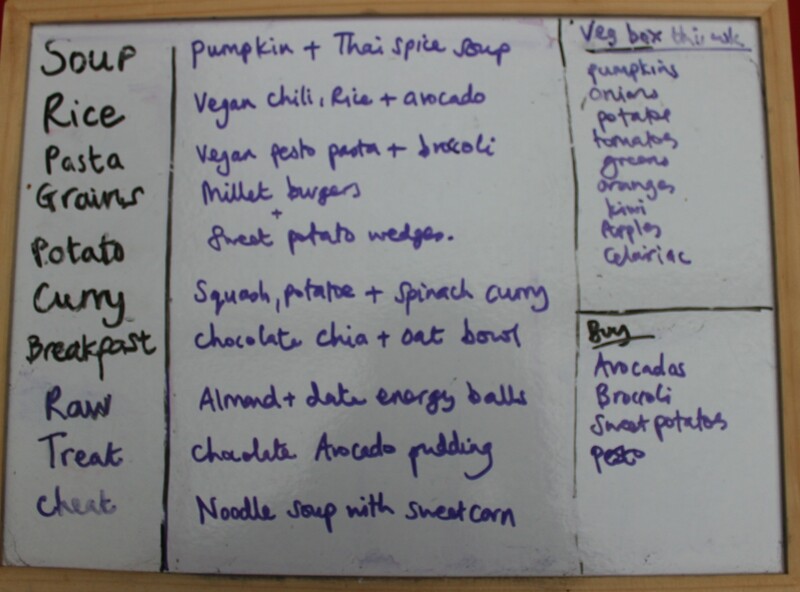 I don’t always use the ‘dinner’ column, some weeks it works better for me to have flexibility about which meals I cook on which days, allowing me to react to unexpected events like kids coming over after school for dinner. 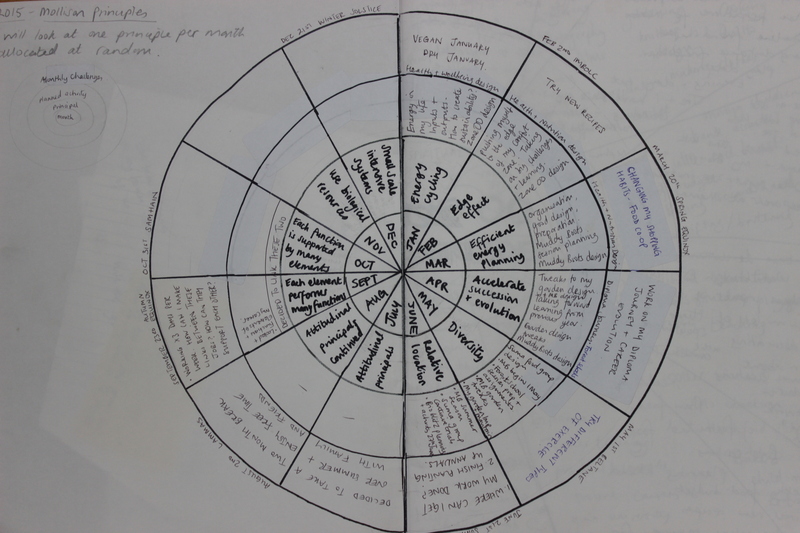 A wheel of the year challenge planner. Each month is given a Permaculture principle as a theme and a challenge to participate in. This worked well until June, then I have floundered a little with this one. I found my available time to work on permaculture diploma projects has shrunk significantly over this year due to other work commitments. So the task of finding out about and writing a blog post each month on a principle rather fell to the bottom of my to-do list. I have tried to get back on track and hope to complete the challenge for the year albeit in a rather shortened version than I had envisaged. A calendar to keep track of exercise challenges and events coming up and participated in. I have updated this regularly with the main exercise activities that I have done. It is gratifying to see these all listed in one place and see how busy I have been! So did these designs help me to fulfil my aims? PNI evaluation. POSITIVE – my knowledge of health is far improved from where it was 18 months ago. I eat a mainly vegan, wholefoods diet now and feel that this suits my lifestyle and body type. I have more energy and feel fit and strong, I have not lost weight but feel my body is more muscular now. I enjoy cooking and have made some really positive changes around how we buy food and manage our food budget. I have thrown away my scales and am on my way to loving and accepting my body as it is now rather than pining for what it used to be before I was a mother. NEGATIVE – I don’t always use the planning tools that I have created due to time constraints, laziness or just forgetting about them! I feel more organised and the week runs more smoothly when the tools are used. So I will be making a concerted effort to use them more in the future. My children, particularly the younger two don’t always eat what I make them. They can be fussy and so self-limit their diets, which can be rather frustrating for us all. I will keep on offering them tiny bites of these health-giving foods in the hope that they will come around eventually. INTERESTING – This aspect of this design led me onto another design (Leicester food group) about how I buy and plan my foods. See this design write-up for more details. POSITIVE – I found a cheap gym to join and use it on a weekly basis. I attend a boot camp class, yoga, use the gym and swim each week. I found a local dance class and take part in a tap and a ballet class each week which is fantastic fun. I have taken part in lots of running challenges, muddy runs and 10km cross country runs. I try to fit running into my life and really enjoy the clear head space and quiet time that this gives me. We take a lot of walks as a family and are encouraging the kids to pursue their sporty interests of running, bike-riding, swimming and climbing. I have been on a few date-nights with my husband, but not enough! NEGATIVE – My exercise opportunities are at the bottom of the priority list. If Joe has to work late, then I can’t attend. So Ideally I’d like to find another childcare option as a fall-back option for next year so that my needs don’t always come last. The same goes for ‘me-time’ This has also slipped down my list. I have been super busy this year studying and building up my business. I love these activities, but they take every available moment that I had. So time away from the children is generally spend in front of the computer working hard and time for exercise and relaxation is squeezed. INTERESTING – I have noticed that if I prioritise exercise and time out for myself, it makes me a better parent and partner as I am happier and calmer. I need to remind myself of that and grab that 30 minute run or long bath to unwind rather than tidying up the playroom. I think every parent has this internal debate about want versus needs and where to draw the line. 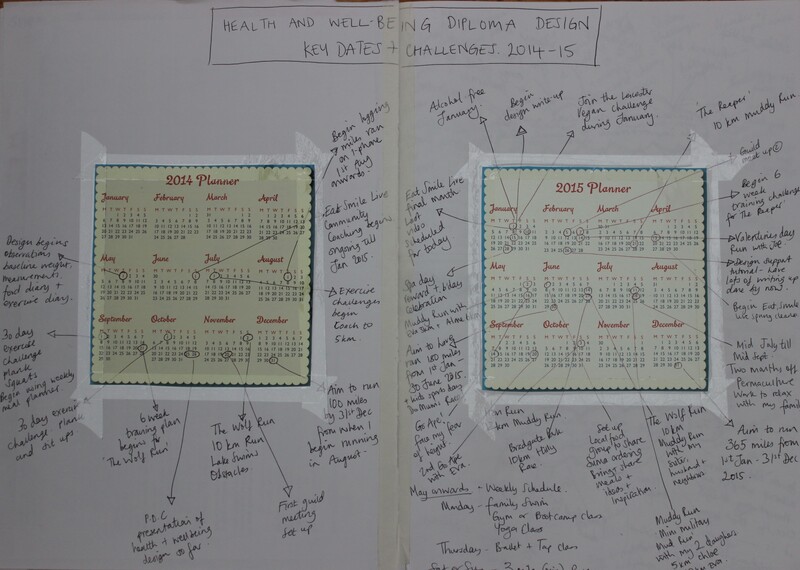 POSITIVE – I have taken part in 3 thirty day challenges and a 6 month health coaching course. I have learnt a lot and made positive changes around my health. I want to keep learning more and making improvements. I am enjoying the journey. I enjoy having regular small challenges to work towards and this gives me momentum. NEGATIVE – The negative here really just echo the ones mentioned in the above areas, resistance from family members and lack of time. INTERESTING – I have met some interesting people along the way and its fascinating how they are fitting into my social circle. My health coach now attends my outdoor playgroup along which her young daughter and some people I met online at FB food forums have now become good friends. Work in more free-time to my weekly schedule and spend this on me-time. quality time with my husband or one to one with my children. This entry was posted in Uncategorized and tagged Adventures in whole foods, Evaluations, exercise, food, food choices, food shopping, My health and wellbeing design, South Leicester food group, Tweaks by emilycrofton. Bookmark the permalink. There will always be challenges are we can’t control others (and shouldn’t), although it would be nice if our kids ate all we have them with gusto. I tried a new veggie out with my daughter this evening and ended up eating the lot myself as she reminded me she didn’t like vegetables. Then she ate a whole corn on the cob! I hope you find an alternative, fall-back for childcare. Or an alternative way of getting your me-time.